The Inconel (high nickel/chromium) screen has a mesh that is slightly smaller than the cells of the catalyst. If fly ash gets through the screen, it should go through the combustor. The screen is easy to see and easy to clean (like the filter in a clothes dryer). Fly ash ON the combustor can be a problem, but in our research, the upstream screen will pretty much prevent fly ash from accumulating on the catalyst. Inconel is durable in high heat environments, and has better conductivity than stainless, so it’s better at distributing/diminishing heat from flame impingement. We now use a similar screen design along with stainless steel catalysts (see last point below) in all of our woodstoves. The heat from the catalyst is pointed at the front of the stove (and believe me, you can feel it). 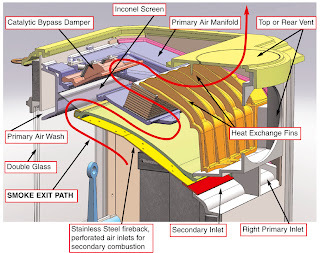 Additional heat generated by the catalyst is captured by the stove through the long exit path and the heat exchange fins. This is good for more percentage points on the efficiency scale. Why waste heat if you don’t have to? The stainless steel fireback adds durability in one of the hottest parts of the stove. Secondary air enters the stove between the stainless fireback and the cast iron back plate. The bypass damper is controlled by a short rod in the center/front of the stove. It’s easily accessible for stoves installed in front of fireplaces. We are using double glass (added insulation) and an airwash. The same system has worked well on our other stoves. We are using a “diesel foil” stainless steel catalyst with a face area of approximately 35 square inches. The wall thickness of the diesel foil is .003” and the design was originally developed for diesel engines. The open area is over 96% (because of the thin walls). There are approximately 50 cells per square inch of surface area. The advantage of the diesel foil catalyst over ceramic is that we get almost 50% more open area at the face AND about 60% more surface area in the catalyst (both because of the thinner walls). The thinner walls heat up faster (better activity at low burns) and the stainless is more durable than ceramic. All of which produces a cleaner burn, and greater efficiency.